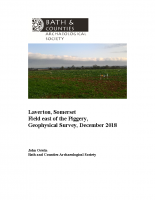 New report : a Roman site near Laverton Piggery? The field just east of the Piggery, by the crossroads just to the north of Laverton village, is 1 – 2 kilometres south–east of BACAS’ excavations at Blacklands. The field itself slopes very gently to the east. The northern portion is gentle, but it then slopes steeply away into the valley of the Wheel Brook. Time became available in mid winter to conduct two days of survey, and this limited the area which could be investigated to just over 2 hectares. The survey concentrated on magnetometry, but the small area of resistance survey provided support to the magnetometry results. The surveyed area showed a round feature some 20 m across, possibly all that remains of a barrow, with a short linear feature to the west of it. These were just within the southern edge of the plot, so there may be further archaeological detail just to the south. Nearer to the eastern edge is a large ditched enclosure with a right angle corner but with a wavy western side and with a probable entrance to the north. At the entrance, the western ditch terminated in a large pit. There are signs of an eastern side to this enclosure, but the geophysics on this side is indistinct. There is no direct dating evidence for this enclosure, but the entrance seems to point at the massive Peart Villa (surveyed in 2003 – 2004), 1 km to the north, and this may imply a Roman origin. There are also signs of numerous pits within the survey area.